Congratulations to "Amanda", the winner of Gail's giveaway. Thank you to all who participated! I love reading trilogies. Probably it’s because when I find a fabulous book, I hate to see the story come to an end. I can always reread it, of course, but knowing there are two more books in the series eases the pain a bit, giving me something to look forward to. So it’s no surprise that when I sat down to craft one of my own romantic suspense stories last year, I decided to make it a trilogy. I had an idea that I thought would work, one I’d been mulling over for a couple of years, about three teenage girls who all run away from their homes for different reasons, then meet on the streets of Baltimore. They band together for protection and become friends. But then their lives take a drastic downturn when they witness a murder, sending them on the run again. Terrified that the murderer will catch them, the three girls make a pact: they’ll change their identities, protect each other forever, and never reveal their terrible secret, no matter what the cost. I decided to call the trilogy Buried Secrets. The first story begins fifteen years after the murder. B.K. (Brynn) Elliot is now an award-winning, but reclusive photojournalist who chronicles the gritty reality of life on the streets. Haley Barnes is a social worker who operates a shelter for pregnant teens. Nadine Seymour is a brilliant plastic surgeon who shuns the spotlight and does pro bono restoration work on battered women. The trilogy kicks off when a chance photograph in a newspaper reveals Brynn’s identity, blowing the lid on her secret past -- and putting the killer hard on her heels. The trilogy continues as the killer -- and the other two girls’ private enemies -- come after them in turn. Great idea, right? I thought so, too...until I started to write it. Tying the killer to all three plots was hard enough. Weaving in the threats from their home lives (the dangers that originally caused them to run away) was tougher still. But to add to the complexity, various secondary characters overlap in all three stories. Some of these characters have connections dating back thirty years or more. Their ages and time lines had to match up, both in the backstories and current plots. By the time I finished, I felt half crazed. How on earth do other writers do this? Keeping all the characters straight threatened to drive me insane. But at the same time, this was probably the most satisfying project I’ve ever done. I loved watching these three strong women battle their enemies. It was fun to see them come to terms, one by one, with their troubled pasts. I especially enjoyed watching them find love in the arms of worthy men who could give them the happy endings they so desperately deserved. And I discovered that despite the work, despite the head-bashing complexity, it was just as much fun to write a trilogy as it was to read one. And as soon as I recover...I will definitely do it again! 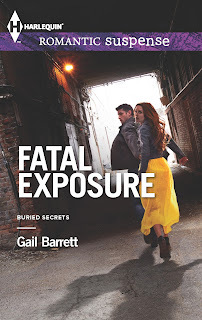 Gail will be giving away a copy of FATAL EXPOSURE to one lucky person leaving a comment or email entry. His gaze swung back to hers. Several seconds ticked by. His scrutiny made her uneasy, the intensity in his eyes making it impossible to breathe. And, suddenly, Brynn suspected he knew more than he’d let on—about her relationship to her stepfather, about her troubled childhood, about the horrific abuse that drove her from home. That he was simply biding his time—like the trained interrogator he was—waiting for her to confess the truth. She couldn’t believe how tempted she was to do just that—to forget that he was a cop, to ignore the danger hounding her footsteps and tell him the unvarnished truth. But then, Parker’s expression changed. His eyes were just as intense, but hotter, more hypnotic, like whirlpools dragging her under—in a decidedly sensual way. Her pulse battered her throat. He pushed away from the truck and moved even closer, trapping her against the cab. And that insane attraction rippled between them, that unruly maelstrom of need. Her breath backed up in her lungs. Her belly tightened, acute tremors of excitement tripping along her nerves. She tore her gaze from his jet black eyes to the black stubble shadowing his granite jaw, and stalled on his gripping mouth. Then he reached out and stroked his finger down her cheek, sending a torrent of pleasure streaming through her veins. Was he going to kiss her? His gaze dropped to her mouth. Her heart nearly leaped from her chest. And for a wild moment she wondered if she should push him away—or pull him close. Giveaway ends 11:59pm EST June 20th. Please supply your email in the post. You may use spaces or full text for security. (ex. jsmith at gmail dot com) If you do not wish to supply your email, or have trouble posting, please email maureen@justromanticsuspense.com with a subject title of JRS GIVEAWAY to be entered in the current giveaway. I'm a huge fan of trilogies & series-- I love seeing connected characters get their own HEAs, and previous characters popping up in subsequent books. Congratulations on finishing your thesis, Cris. That is fabulous! After all that hard work, you deserve to relax!!!! I love trilogies too, but if I know that the title is the first one in a trilogy and the other two aren't out yet I will wait to read it. I like resolution and I rather wait until I can read the stories all at once. I once waited for all six books in series by a favorite author to be published before I started to read them. That really tested my patience. That's always the problem, isn't it, Beth? I confess that I often do the same thing, unless it is an open ended series. I had to write pretty fast to get these three books out close together, but June, August, and December isn't too bad. I love continuing series and especially trilogies as the story arcs tend to be well plotted and thought through. Congratulations on starting and finishing this project. Thank you, Jonetta. It really was a challenge, but I enjoyed it. Each book has a good conclusion, because I didn't want to leave the reader hanging, but there is a mystery that threads through all three books, too. It's always fascinating to figure out how an author works characters into a series. I love cameo appearances from the other characters just to see what they are up to. But making each book unique and tying them together, too is just amazing! All the best to you, Gail! Wow, that is something... having a killer connected to three different books... you have intrigued me... very curious about each girl's story, their enemies and what comes about... thanks for sharing! It was an interesting book to write, Colleen, especially since halfway through the second book, the villain changed, and the person I thought was the killer turned out not to be! Seriously. I was plugging along, writing away, and suddenly I realized who it was. So the plots ended up surprising me! Hey Gail! I'm so excited about this trilogy! I love your books and to have three interconnected ones is really outstanding. Writing trilogies is hard, but so worth it...esp when you're done! Hahaha! Looking forward to the next book! Hi Gail! I love trilogies especially when the writing and voice is expertly done. I'm looking forward to reading yours! A trilogy works very well for me as a reader. I get to stay with the world and characters longer, but they don't overstay their welcome. Exactly, Mary. With most series I get burned out after about seven books, sometimes less. There have been a couple of mystery series I have stuck with longer, but in general, a trilogy is the right length for me. Not as short as one book, but not endless like a series. I love reading trilogy. Trilogy are wonderful. I get enough information about the main characters and the story does have an ending. After a while, following a series could be too tedious. From time to time, I wonder if there is an ending to the story especially when there is nothing new in the story any longer or the characters just start to sound ridiculous and are no longer fresh. I love trilogies too! And I'm currently trying to write one and having fun linking the overall arc to each of the three stories. I've been looking at my local store for your book, but the May series are still on the shelf. Guess I'll have to order online. Love your writing, Gail. This sounds like an awesome trilogy! I also like trilogies, because there is always a secondary character(s) that I want to find out more about. Thanks for the chance to win. You're welcome, Martha. And I agree about the characters. It's interesting to see them in all the stories! Not just trilogies, but a good series too. Like you, if I latch on to a book and its characters I don't want to let them go. Amanda, one of my favorite series was a mystery series set in Mallorca, Spain. The author was Roderic Jeffries. I loved the detective, a hard-drinking, old-fashioned Spaniard who yearned for the old days:)))) So you are right; the character makes all the difference.